It used to be that I didn’t see much point in carrying around a device that keeps track of the time since most people keep their cellphones on hand. However, there are times that it looks bad to be glancing at your phone. If you run into those situations often, but don’t actually want to wear a watch, this could be a happy medium between the two. This keychain could easily be concealed in your pocket and you can keep track of the time as well as all of your important documents. 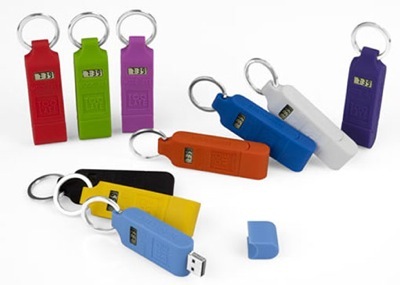 The Too Late USB drive comes in a total of ten different colors. It’ll hold 4GB of your data, which isn’t too bad. Then it has the keyring that’ll allow for you to keep it attached to your keys if that makes things easier. It also has a small LCD screen that you can read the time on. The drive is impact resistant, which is good news for those of you that tend to drop your keys on a regular basis. Right now it’s a little difficult to find the pricing information on this USB drive, but you could always contact the retailer to find out more.